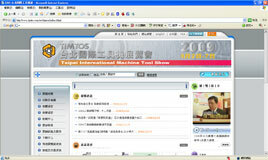 The Taiwan Association of Machinery Industry (TAMI) said the 2009 Taipei International Machine Tool Show (TIMTOS 2009) is fully booked, meeting only 63% of the exhibitors` demand. TAMI recently completed the screening of the booth applications for the TIMTOS 2009, to be held at the Taipei World Trade Center (TWTC) and TWTC Nangang Exhibition Hall. TAMI said demand for booths totaled 7,600, far exceeding the capacity of the two venues, which will house 4,800 standard booths at the machinery fair. Co-organized by the government-backed Taiwan External Trade Development Council and the TAMI, the TIMTOS 2009 is slated for March 2-7 at the three halls of the TWTC and TWTC Nangang Exhibition Hall. The TAMI said the demand for booths is the largest on record for the overwhelming turnout from Taiwan-based producers of machine tools and components. TAMI said the Taiwan machine-tool and components industry has been growing at double-digit pace annually over the past several years, creating substantially more newcomers. To highlight partnership among domestic exhibitors, TAMI has asked large machine-tool firms to jointly display with subsidiaries at the TIMTOS 2009. For instance, major firms as Fair Friend Enterprise Co., Tongtai Machine & Tool Co., Goodway Machine Corp. and Frejoth International Corp. will each occupy over 50 standard booths. The TAMI will use the TWTC Nangang Exhibition Hall as the major venue, which offers 2,830 standard booths, 2,510 of which will be occupied by Taiwan-based firms. The Hall 1 of the TWTC will have 1,330 standard booths, as well as mainly displaying mechanical components, CAD/CAM (computer aided design/manufacturing) software, and machinery for metal pipes and plates. The Hall II of the TWTC will have 317 standard booths, which will mostly display pressing machinery, with the Hall III to have 320 standards booths to accommodate the late-registrants.